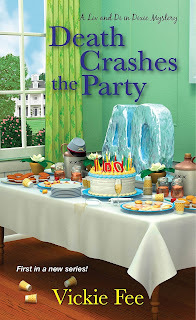 Liv McKay is a party planner, the owner of Liv 4 Fun, and at the moment she's planning a fortieth wedding anniversary party for the wealthy Erdmans. 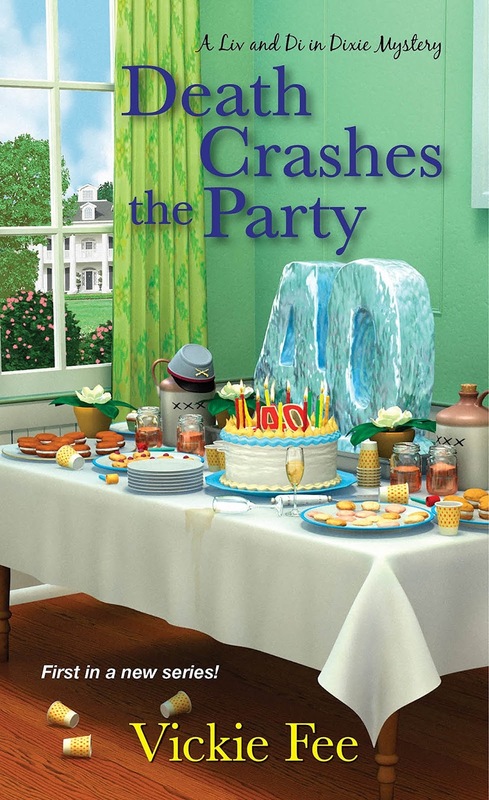 But when she checks the freezer in their shed to see if it will hold the requested ice sculptures, she finds a dead body...and backing up, trips over another one, dressed in a Confederate uniform. With the Erdmans prostrate over the discovery, it is left to Liv to call the local sheriff, 'Dave' Davidson, and inform him of what has happened. Dave is also seeing Liv's best friend, Di Souther, so what Dave knows, Di knows, or soon will. It also turns out that the dead men worked for Liv's husband, Larry Joe, at his (and his father Daddy Wayne's) trucking company. 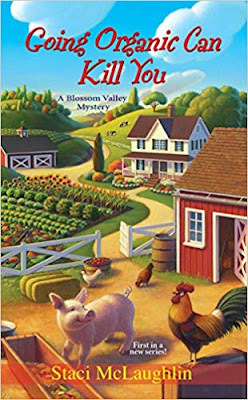 With a personal stake in the murders and her husband and father-in-law being considered potential suspects, Liv does what any devoted wife would do: she decides she's going to "help" the sheriff find the true killers. But all is not what it seems. It is soon also discovered that the dead men, Darrell and Duane Farrell, had a hand in something not so savory, drug trafficking and dealing in stolen goods. And Liv, in her eagerness to clear her husband's family of any wrongdoing, could get herself killed also in the process. For the most part, I enjoyed the book, and for a first effort it's pretty good. Liv manages to juggle her business and her marriage easily, and her friendship with Di is worthwhile. But I felt that she shouldn't have 'helped herself' to certain evidence, but told the sheriff about it instead, and I also thought it was odd that Dave just shared information regarding the murders with both Liv and Di. It seemed to me that offering this info just basically told her it was alright for her to go ahead and 'help' with the investigation - given that two people were dead, why would she (or the sheriff) willingly put her in the way of a killer who was still on the loose? It also seemed that with the FBI involved, she Wouldn't Want to Go There, but she did. That bothered me. I also thought there were some things that didn't need to be added (do I really care if she chases a fly around her house? No.) and I felt that the book needed more depth to it. Although we meet the characters, we never really get to know them. We do know that Liv and Larry Joe (that name!) love each other, but never really know why. I'm hoping to learn more in later books. 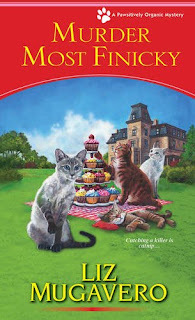 However, the mystery was decent, and I think Ms. Fee could, in fleshing out the characters more in later books, continue this series for quite a while. 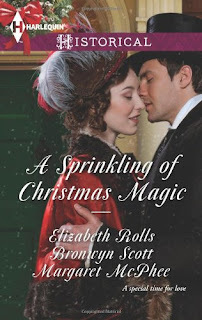 Christmas Cinderella by Elizabeth Rolls: Handsome country rector Alex Martindale dreams of kissing his spirited schoolmistress and never having to stop...With some mistletoe, he may just get his wish! The Captain's Christmas Angel by Margaret McPhee: Returning to England for Christmas, Sarah Ellison discovers a man adrift in the Atlantic Ocean. Nothing could have prepared her for the gorgeous Captain Daniel Alexander, or the secrets he keeps! Every now and then it's a good idea just to let your brain relax with a book that offers nothing intense, nothing too deep. Such is the case with Christmas romances. Christmas Regency romances are usually the best of these, and for the most part, this book could have been numbered among those. 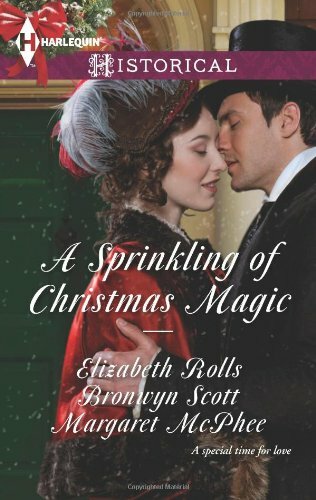 A Sprinkling of Christmas Magic is a series of three short stories, from three well known authors. In the first, Christmas Cinderella, Alex Martindale is lonely at Christmastime, and decides he needs an assistant who can also teach the village children. What he doesn't expect is that a young woman, who has been unfairly left without a penny, would desire the position in order that she will not become an unpaid companion to a distant relative. After seeing firsthand her situation at home, he reluctantly agrees to take her on temporarily, in order to see if things will work out. When they do, he finds himself spending more and more time with her, and realizing that she might just be what he's wanted all along. In the second, Finding Forever, Catherine Emerson has returned home after living for five years in Paris with her aunt. What she wants most in the world is to live permanently at the Deverill home, where she has spent most of her childhood with her best friends. Her idea to become a part of the family is to marry Channing Deverill, whom she has been in love with as long as she can remember. But it is Finn Deverill, the older brother, who quietly draws her to him. When he kisses her one afternoon when they are found alone during a skating party, she begins to wonder if she has been wrong all those years. In the third, The Captain's Christmas Angel, young widow Sarah Ellison sees a man adrift in the ocean, and discovers he is Captain Daniel Alexander, a man with secrets he is not at liberty to divulge. The more time they spend together, the more she realizes that she is falling in love with him, and hopes that he is also falling in love with her. While I enjoyed reading these three stories, I enjoyed Ms. Scott's the most, truly being a nice Christmas romance, with two people who fall in love over a period of days with just a few kisses between them (but oh, the things conveyed in kissing can be so much more). 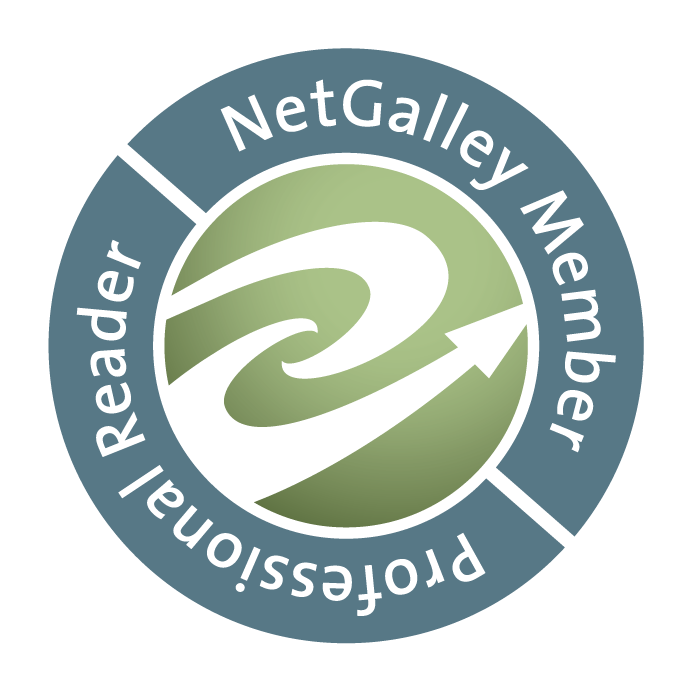 That being said, it was worth reading for anyone who enjoys Christmas Regencies. Recommended. In The 20/20 Diet, Dr. Phil McGraw identifies seven reasons other diets fail people over and over again: hunger, cravings, feeling of restriction, impracticality and expense, boredom, temptations, and disappointing results or plateaus. Then, he addresses each of these roadblocks by applying the latest research and theories that have emerged since his last best seller on the same topic, The Ultimate Weight Solution. Dr. Phil and his team have created a plan that you can start following right now and continue working for the rest of your life. In this diet, readers will start by eating only 20 key ingredients, called the "20/20 foods," which theories indicate may help enhance your body's thermogenesis and help you feel full. But that's just the beginning. 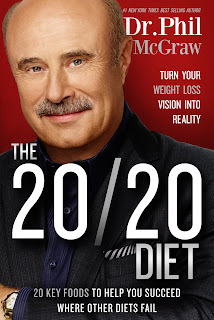 This book explains why you haven't been able to lose the weight before, and empowers you with cognitive, behavioral, environmental, social and nutritional tools so you can finally reach your goal, and learn lifelong healthy habits to maintain those results. In 'theory' as is stated in the blurb, this diet should work; but theory isn't fact. And, to be truthful, it probably does for some people. But in order for it to work you have to be able to like the food you're eating. Although Dr. Phil stresses that you can live with eating certain foods for five days at a time; not necessarily. I don't eat prunes, hummus, coconut oil, mustard, or any number of foods he mentions (fish and eggs are an exception, but even I couldn't eat them straight for five days). If you're making faces every time you put anything in your mouth, you're doing it wrong. Eating only salads and smoothies for ten days? That's a bit much, in my opinion. And if you eat out, you should make your own dressing and bring your own salad toppings. Really? Go to eat at a nice restaurant and then order a $10 bowl of lettuce, pull out your own toppings to add? Classy. Yes, eating salads and drinking smoothies will help you lose weight. But what is the point if all you're eating is lettuce every single day? Unfortunately, the book tells you nothing new - just don't eat bread, pasta, sugar, fried foods - the same as every other diet book; and to exercise. I just don't feel there is anything new given in this book. I think nearly everyone knows that you need to eat right and exercise to lose weight. You need to drink water. But if you want people to lose weight, you also have to give them appetizing foods to eat, and unfortunately, you won't find it in this book. The Other Side has hired Driscoll Investigations. The owner of Stone's Throw Lighthouse Bed and Breakfast insists that a tarot reading told her to hire Giulia to evict the family ghost. Since the ghost is cutting gas lines and flooding cellars, Giulia and her husband frank head to the B&B to discover the real perpetrator. The client also has a family legend: A highwayman stole a pile of gold. Giulia has a pile of suspects, including a psychic the client hired to conduct weekly seances. So much for romance with Frank at this getaway. Instead, Giulia's juggling arson, creepy clown dolls, and the psychic going all Exorcist on her. Then the ghost tries to push the client off the lighthouse and throw Giulia down three flights of stairs. It should've known better than to mess with an ex-nun. Giulia has connections and she's about to use them. Giulia Driscoll, private investigator, is in her office one morning when a woman rushes in and demands that she go with her across the street to see a psychic. Acquiescing, she discovers that the psychic, Rowan, has decreed her the 'veiled woman' and that she needs to help MacAllister 'Mac' Stone, the woman who came to her office. Mac runs a B&B called Stone's Throw, which is a renovated lighthouse, and it seems she has a haunting - a resident ghost - and she needs Giulia to help her get rid of it. Showing Guilia pictures of strange goings-on, she convinces her to find out the truth of what is happening. Although she doesn't believe it's a ghost, she agrees to help, and she and her husband Frank, a homicide detective, go to Stone's Throw posing as guests until Giulia can figure out what - or who - is doing their best to see that the business fails. When Giulia arrives - sans Frank, who has a last-minute case to wrap up before he can join her - she meets a colorful array of guests, all who have been there before and can't say enough good things. She attends an evening on the beach, with everyone making s'mores, but then sometime later there is a scream and it is discovered that someone has set that same area on fire. So Giulia decides that Mac's fears are real, insofar as someone is attempting to put her out of business, but still skeptical of that someone being a ghost. Eventually the 'accidents' escalate, and between her and Frank investigating on the sly, Giulia has no dearth of suspects. Everyone at the B&B is on her list, along with Mac's nephew, Walter, who runs a boat rental on the beach, and Lucy, the housekeeper. In fact, the only one she's scratched off the list is the handyman who has to keep repairing the damage the 'ghost' is doing. In between snippets of a little personal time for themselves, they know they're only pretending to be actual guests, and so to this end manage to surreptitiously question the others while maintaining a low profile that won't cause the others to question them to any great extent. Although what Giulia finds out is interesting, not a lot of it appears to be dangerous, which makes it more difficult for her. Add to this the crazy as a loon local psychic, Solana, that Mac has hired to entertain her guests, and the psychic's husband, Cedar, and and Giulia has her hands full. Especially since the psychic is also referring to Giulia as the 'veiled woman' (a reference to Giulia's former days as a nun) which only serves to aggravate Giulia even more. When there is an attempt on Mac's life, Giulia knows she must step up her game and step in quickly to find a potential killer still on the loose. I really loved this book, and can't say enough good things about it. Giulia is an ex-nun-turned-investigator, and has seen it all. She's barely finishing a cheating husband case (and not very pleasant for her, but necessary just the same) when Mac rushes in demanding her help. So off she and Frank go to the B&B, doing their best to seem like a couple on a romantic getaway while trying to figure out what is going on and who is attempting to put Mac out of business. But find out she does, and watching her put the pieces together is great fun. I love books that make me think, right along with the protagonist, and this book does exactly that. It's not an easy read, there is a slight otherworldly feel to it - due in part to the resident haunting - but Giulia gets the answers she's looking for, and therefore, so do we. When the end comes and the answers are revealed, it's almost sad to close the book. 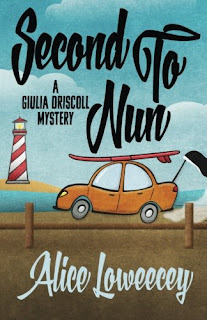 To this end, Ms. Loweecey has given us another Giulia Driscoll mystery that's a worthy successor to the last, and I hope to see many more in the future. Highly recommended. Stan Connor is a pet chef in the town of Frog Ledge, Connecticut. Her goods are so delicious that she is being sought after, and cooking in her kitchen is no longer going to be feasible. So she wants to open a brick-and-mortar store, but needs financial backing. That backing has unexpectedly appeared in the form of Sheldon Allyn, a celebrity chef known as "Mr. Pastry." He has asked Stan and her cat Nutty to a weekend getaway along with several other chefs in order that at the end of the weekend they can present a sit-down, five-course dinner for a group of investors. It turns out that Stan was invited because one of the investors has a cat that eats as well as humans, and so she must impress both owner and cat. So Stan and the other chefs are led blindfolded to a secret location. But one of the chefs doesn't arrive with the others and no one seems to know where he is. Unfortunately, Stan soon finds him - dead on the beach. While trying to recover from the shock, she and the remaining chefs are told they will proceed as planned. Stan wants Sheldon's backing, so she agrees to go on. Since the home they were taken to is now a crime scene, Sheldon puts them up at a nearby upscale hotel, and they are told they will be using the hotel's 'secret kitchen' to prepare their meal. Unfortunately, the hotel is nearly full, and Stan will have to share a suite with Maria, one of the chefs who has developed an affinity for Nutty, and Therese, one of Sheldon's employees, who hasn't developed an affinity for anyone or anything. But then another chef goes missing, and just when she wants to forget about the entire thing and go back home, her estranged sister calls her out of the blue and asks for her help. It seems Stan's sister Caitlyn has a problem - a big one - and needs Stan's assistance. Reluctantly she agrees, which means she'll need to stay with the other chefs a while longer - which could also mean that one of them is a murderer, and she doesn't know which one - it could even be one of her temporary roommates. I really can't say anything else without giving too much away, but I will tell you that this is a great addition to the series. This time out, Stan thinks she is finally going to achieve her dream of a pet bakery, but when murder temporarily derails her plans, she realizes that even though she wants to stay out of the investigation, she is being pulled in. She misses her boyfriend Jake and wants to go home, but knows she can't. To make things worse, it gets to a point where she needs to ask Jake's state trooper sister Jessie for help; and she believes that her relationship with Jessie is tenuous at best, which makes it difficult. But in this book Stan is beginning to figure things out and where she wants to be in life, and that's a good thing. I love the fact that she's progressing in her life and we're along for the journey. We learn a little more about her and a lot more about Jessie, who up until this book had been a closed soul. We get a sense that Stan is beginning to understand Jessie more as a person, not just as an officer of the law and Jake's sister. When the murder is solved, and all is explained, you can't help but feel a bit of sadness for the person, and understand why they were driven to do what they did. Given the circumstances, they truly felt they had no other choice. In the end, the book was a great read. The secondary characters were given enough to do that they weren't superfluous to the story, and that's always a plus. Stan is smart and doesn't make rash decisions, nor takes chances, which I like. Ms. Mugavero has added a delightful addition to the series and I look forward to the next. Highly recommended.